My local Dollarama (Canadian dollar store chain) usually just has some Sally Hansen, Wet n Wild, snakeskin Essies and loads of odd brands like Mariposa. But I lucked out this week and found some OPI and Nicole by OPI (they usually have the latter, but in really boring/unfortunate colors) that piqued my interest. I guess browns and golds are not as popular, so they end up at the dollar store! The masses’ loss is my gain! So I lied. I couldn’t help trying out my new bottle of Merry Merlot!, especially since my CC Warming Trend mani had started to chip (my fault, as I didn’t use a base coat). 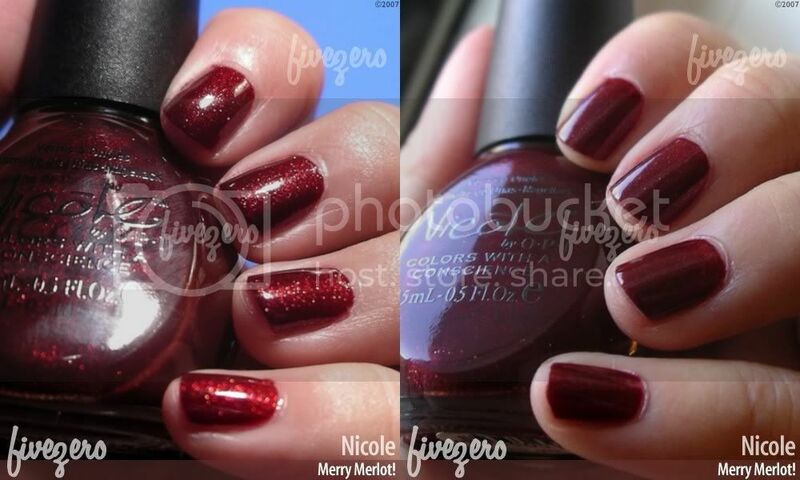 Merry Merlot is one of 4-6 new polishes in Nicole’s holiday collection this year. I say 4-6 because I can’t quite remember. I spent most of my time gawking at Merry Merlot. 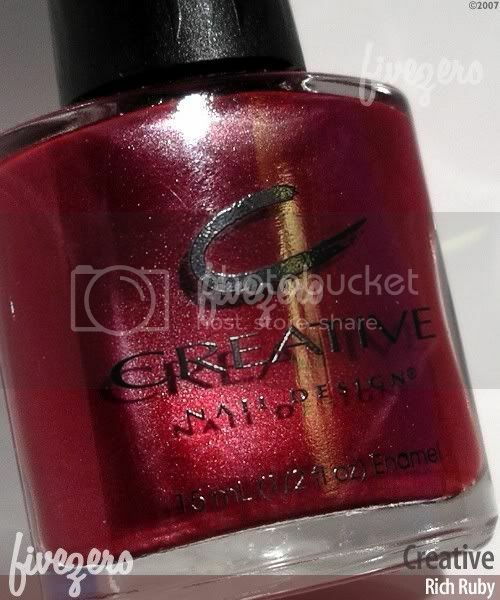 There was a pretty but not quite spectacular satin-y red shimmer, what looked like a white version of Merry Merlot (white with white microglitter), which I’m plotting to go back and get, and probably some pinks and bronzes but I don’t remember. Sorry, I was naughty! Here’s Merry Merlot! in all her sparkly, deep red glory. Not as blinged-out as China Glaze’s Ruby Pumps, but just as pretty and festive. Holiday parties, here I come! Rating: 5/5. I won’t have time to do any swatching for the time being, but here are bottle photos of a few new polishes I picked up. They’re lovely jewel-tones and great options for those upcoming holiday parties. 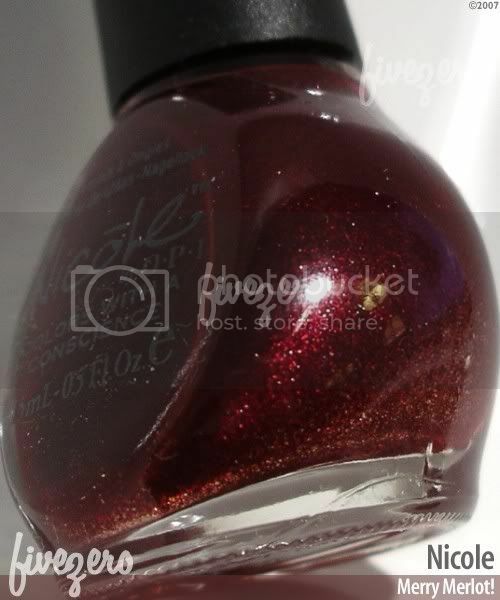 Nicole by OPI – Merry Merlot! After being discontinued for several years, the Nicole line of nail polishes by OPI have been spotted back in some Shoppers Drug Marts (a pharmacy) in Canada. 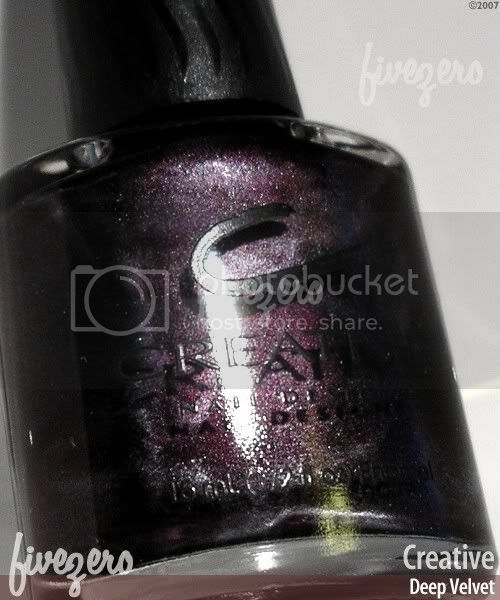 Strangely enough, however, it appears that OPI has kept some of the original colour names, but changed the colours! I just need to take a time-out here and shriek: “Stop doing that!! !” It is so freakin’ annoying. Is it that hard to come up with a new name for a new colour? Gah. Okay, onto the review. 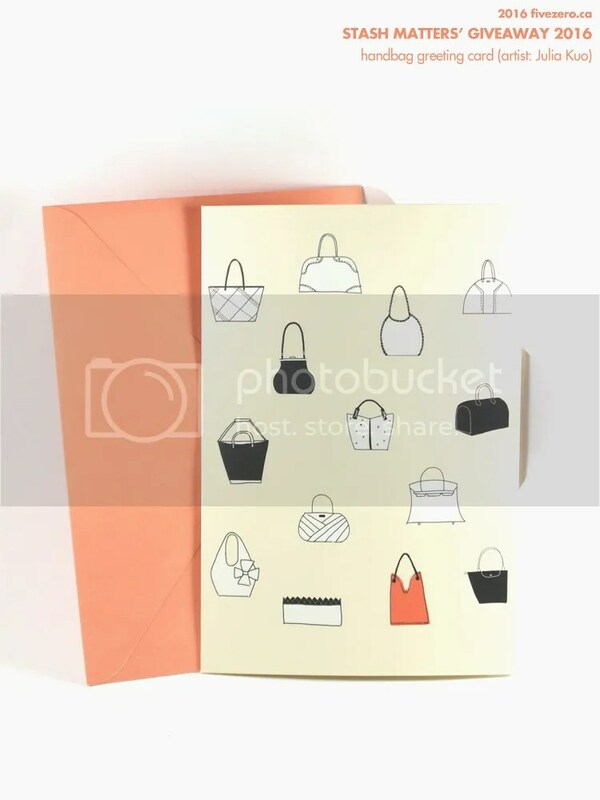 I saw some newer collection Nicole polishes (with new names, thank goodness): Cozy Red Rosey, a gorgeous red, was one…there was also a shimmery gunmetal grey. There were two more, but they didn’t look as interesting. These new polishes were retailing for $10, which I sort of scoffed at. I went to the clearance basket where some of the older, new Nicoles were marked down to $5.99. Much better! I picked up Cocoa à Go Go, code NI 178, a warm, slightly pink-browned copper shimmer. Now, I went to look up the old version of Cocoa à Go Go, and it turns out the original was a light brown creme, with the same code. Hm. I think I like the new version a lot better. This polish applied very nicely and two coats was perfect. I don’t have anything quite like it, so I’m quite happy with this purchase. Rating: 4/5.